The MicroVue iC3b EIA Enzyme Immunoassay measures concentrations of iC3b in human plasma, sera or other experimental fluids. It uses a proprietary monoclonal antibody to a neo-epitope on iC3b to capture the analyte. The trapped iC3b is subsequently detected by HRP-labeled antibodies to C3 antigens. This test provides a rapid, non-radioactive method for assessing iC3b levels. It is designed for investigations into the role and or status of complement activation in numerous research and clinical settings. 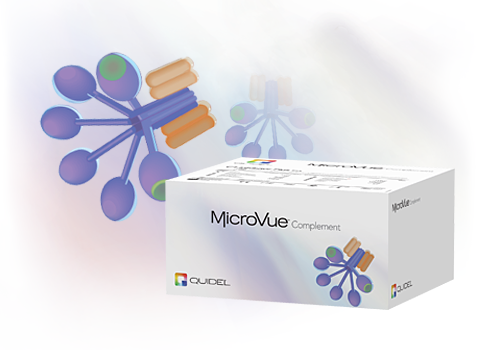 The MicroVue iC3b Enzyme Immunoassay measures the amount of iC3b present in human plasma, serum and other biological or experimental samples. Levels of iC3b are indicative of the amount of C3 cleavage (hence total complement activation) in the sample. Buyon, J., Tamerius J.D., et al. Assessment of Disease activity and impending flare in patients with systemic lupus erythematosis, Arthritis and Rheumatism 35(9)1028-1036, 1992.